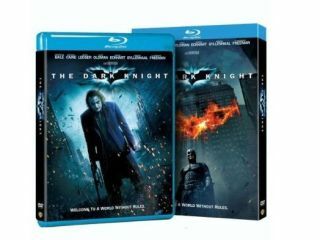 Will The Dark Knight be the start of something special for Blu-ray? With DVD still dominating retailer's shelves, and digital downloads and upscaling players pinching some of the limelight, Blu-ray has had a pretty hard run of it of late. All is not lost for the format, however, it needs the right film release to get back on the straight and narrow. It was the film that gave the DVD format a much-needed shot in the arm when it was released back in '99 and Warner is hoping its forthcoming release will do the same with Blu-ray. Picture-wise, the movie is 1080p, taken from a VC-1 codec and, thankfully, the whole trilogy is presented in its original 2.40:1 aspect ratio. Audio is Dolby TrueHD 5.1. No matter what your quibbles are about the subsequent sequels, there's no getting around the fact that seeing bullet time in HD will be simply awesome. Couple this with the mountain of extras The Complete Matrix Trilogy has, including some HD-exclusive features, and this will be one unmissable Blu-ray release. The Godfather: The Coppola Restoration Collection has been out on Blu-ray for a while now, but its recent win at the High-Def Disc Awards, where it was given the prestigious title of 'Best Blu-ray of 2008' should hopefully make naysayers stand to attention. The Godfather is not just an old re-release, either, the edition is the closest you will ever get to seeing the film as it looked in the cinema in 1972, in 1.78:1 aspect ratio with Dolby TrueHD 5.1 sound. If that isn't an offer you can't refuse, then we don't know what is. Peter Jackson is the king of the home entertainment format. He embraced Laser Disc, giving his comedy horror flick The Frighteners an extensive release, and his King Kong and Lord Of The Rings trilogy are still the best and most comprehensive discs on DVD. Lord Of The Rings on Blu-ray will undoubtedly be something special. While it will be hard to top the original Extended Editions, just seeing The Shires in HD will be something special. And, who knows, he might slip his recent short film 'Crossing The Line' in as an extra. Shot with the brilliant 4k RED camera, it's one of the best things around in HD. The best film of this year by a country mile, The Dark Knight has been mooted by many – and now TechRadar – as the film to save Blu-ray. Number crunching analysts are predicting the movie will hit the magical million mark when it is released in December. The film will suit Blu-ray perfectly, with Nolan promising some hi-def exclusive extras, and you will be able to see the ground-breaking IMAX shots in 16:9. There's no doubt that The Dark Knight will be huge, and with a release date just before Christmas, it could well be the movie to finally make average consumers take the hi-def plunge. While putting a near-silent movie onto Blu-ray may not sound like the greatest idea, the bleeps, whizzes and coo-ing of Wall-E (voiced by Ben Burtt), Pixar's latest and cutest creation, will sound superb in HD when it's released at the end of the month. Pixar movies have the added advantage of being loved by children and adults alike, and with the rest of the animation company's creations already superbly transferred to Blu-ray, Wall-E should be the icing on a very lucrative cake. And considering the CGI animation is among the best seen, it won't be difficult for the last robot on Earth to shine on Blu-ray.